Summer camp at Living Wells Farm is an experience your child will never forget! Our half day camps include all aspects of horsemanship, from scooping the poop to posting the trot. Campers participate in barn chores like cleaning stalls, scrubbing water buckets, grooming horses, and making dinner for the horses! Our riding instructor Elizabeth is especially gifted with teaching children and sharing her passion for horses. A typical day at camp begins at 8:30am, with light barn work. Campers rotate between horseback riding, games to teach important parts of the horse, horse health, and tack. We incorporate outdoor activities like archery, relay races, hay obstacle courses, painting the horses and more. Children should wear cool comfortable clothing. Pants are preferable for riding. Please send a snack and a water bottle. Families with more than one camper discounts apply. We have the privilege of being part of a large equestrian community in New England. With access to clinicians, instructors, facilities, and horse enthusiasts of all disciplines, there are so many learning opportunities at our fingertips. Elizabeth Jewell is our in house trainer. Introduced to horses at a young age, Elizabeth found her passion early and has made teaching horsemanship her life’s focus. She has been working, volunteering, and apprenticing under trainers since she was 13 years old. Becoming a mom has given her insight into teaching children, and she has an appreciation for the different needs of each child. 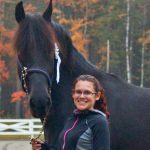 Elizabeth believes that horsemanship is a lifelong learning process, and continues to take lessons with higher level trainers, attend clinics and seminars, and develop new ways to reach her students and help them reach their individual goals. She considers her horses and her students as family! Luke Reinbold is a clinician, trainer, and competitor from the Western Finger lakes region of New York. Luke believes the relationship between horse and rider should be natural and enjoyable. In his Natural Horsemanship clinics, Luke teaches how to build the trust between you and your horse. He utilizes common things found on the trail, terrain work with hills, trees, water, and even items found in the barn, combining everything as a positive learning experience for the horse. He stresses resistance free training methods to teach a horse to trust the rider. Luke trains horses using a straightforward, common sense approach to compete not only in Versatility and Extreme Cowboy Races but also for use on his family’s small Angus farm. 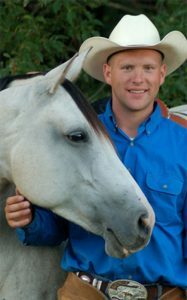 Whether riding trails, showing in the ring, or working cows, Luke’s principles of Natural Horsemanship will improve your relationship with your horse wherever your adventures may take you. While Luke enjoys teaching horsemanship, by day he is a certified law enforcement instructor, and trains law enforcement personnel and cadets in the academy. Luke’s passion is horses, and teaching others how to enjoy these majestic animals as much as he does. Living Wells Farm hosts Luke and his family in the summer for a week of kids’ camps, clinics, and private training sessions. Our extended family at Living Wells Farm stretches down the East Coast. We are fortunate to have support from the Hoffman’s home state of Virginia and from the Curley’s home state of Massachusetts. Volunteers from Virginia have camped at the farm to provide labor on large projects and assist with children’s camps. In 2016 we hosted a week long children’s camp that was put on by a group of teens from Virginia, complete with crafts, music, and of course horseback riding. In the summer of 2017, we hosted a group of teens from Massachusetts that spent 4 days doing renovations, landscaping, and maintenance. We are so thankful for the extra hands, and the teens have the adventure of experiencing farm life first hand! We are also fortunate to be part of the larger community here in Southern Maine. Our Fall Festival, held on the Saturday before Halloween, is a tremendous success due to the outpouring of support from local families and businesses. Stay tuned for more information about our 2018 Fall Festival!